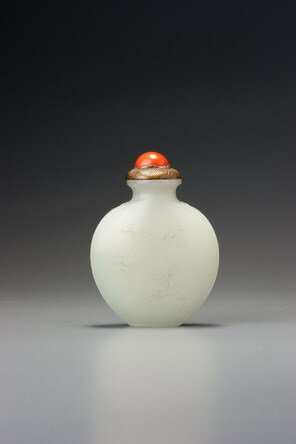 This bottle is of flawless greenish-white nephrite, which was an intrinsically valuable material. The unique frames on the two main panels that wrap around the narrow sides and the foot, terminating in a finely carved lingzhi-head motif at the shoulders, are imaginative and beautifully carved, and the shape of the bottle is both elegant and confident. Often the bottles in this group are not independently of high elegance and finish, the main emphasis being on the added decoration of flowers and poems. The air of the jade-like plum would match an immortal’s makeup. First to come out for the spring wind, it takes the lead for all flowers. Surely the southern branch would be a ‘flower-visiting lad’. In the Tang and Song dynasties, the two youngest graduates of the jinshi exams were called ‘flower-visiting lads’. They had to rush about to the famous gardens and pick flowers before someone else did, or they were made to pay a penalty. This poem is identified by the National Palace Museum in Taiwan as being by the Qianlong emperor; it appears on a jade table screen in the museum’s collection. This bottle has the typical feature that we have attributed to the palace workshops of being well hollowed but leaving a substantial base area un-hollowed. 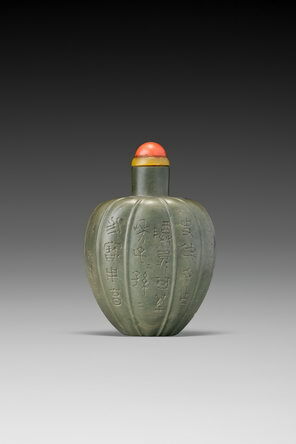 In this case, the hollowing extends only to 4.77 cm in depth, leaving 0.84 cm as the depth of the un-hollowed base area, which is close to the relationship of solid base to hollowed area on a number of other jade bottles in this collection attributable to the palace workshops. This example has a superbly carved foot, of excellent formal integrity, over which great care has been taken, not only in choosing the appropriate shape but in executing it.